I’m back today with another of my Arrow Rock Quilt Camp projects to show you. I did this one for my English Paper Piecing class. It’s called “Grandma’s Flowers”. It’s a good one to learn the English Paper Piecing method on. Although it appears daunting because it only uses 1/2″ hexies, it’s actually easy to learn on because the smaller pieces are easier to hold on to and baste until you get the hang of it. 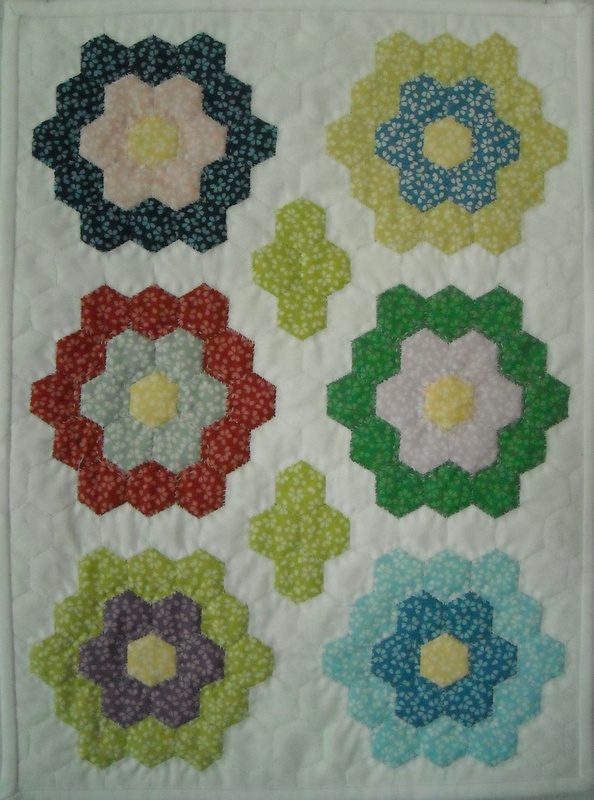 This little quilt finishes at 11″ x 14″, and is only available in kit form. The kit has all the fabrics you need for the top, backing, and binding, plus batting, paper pieces, and instructions, for making the quilt exactly as shown. The kits are listed in my Etsy shop, and there are only a few left. Once they’re gone, they’re gone, so if you want one, don’t delay! I am doing a king size Grandmother’s Garden. So far I have 225 flowers done. I have 175 to go. They are 2″ hexies. I do them while I watch tv at night with my hubby. I am doing my whole sewing room over. TOO dang crowded. So we are making room down in the basement for all my excess. We are very fortunate to have a completely dry cellar. I already have a commercial PFAFF down there. Fast machine. Left to me in my friends will. Now I just inherited 2 more sewing machines from another friend who passed a month ago. People Stop! I’ve run out of room. They are a beautiful New Home and a Kenmore. Both in excellent running condition. There are 10 sewing machines in the house now and 2 sergers. Guess I’ll have to have some friends over to help me do my lap robes for the cancer center and Liones. Will send you befor and after pictures when I am done. It probably will take a couple weeks. But I’ll get there. 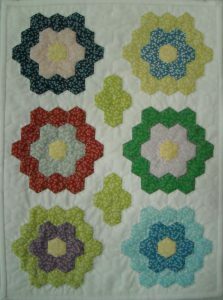 Such a cute little quiltlet! I like the addition of those pluses in the middle.